Today small businesses owners from across the country are coming together to demand lawmakers overturn the FCC’s net neutrality repeal. 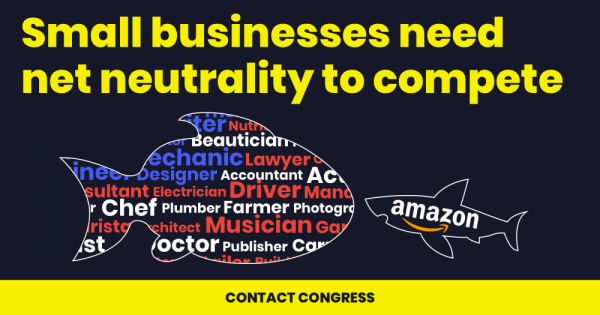 Join with them as part of the Small Business Day of Action for Net Neutrality. Without strong net neutrality protections, Internet service providers like AT&T or Comcast can charge small businesses exorbitant new fees for privileged “fast lane” access to customers online. This amounts to a new tax on businesses across the country, and would significantly undermine the Internet as a level playing field since massive corporations have the deep pockets necessary to pay the expensive new fast lane fees that smaller competitors simply cannot afford. Today small over 7000 small businesses are fighting back in an online day of action, and we need your help. Click here to contact your reps RIGHT NOW to tell them to restore net neutrality by signing the CRA discharge petition ASAP. Net neutrality is not a partisan issue, otherwise, I wouldn’t be emailing you about it. 83% of Americans support net neutrality and the open Internet regardless of their political affiliation. Small businesses rely on the open Internet to grow and reach customers online. That’s why I’m asking you to help us get the Congressional Review Act (CRA) resolution to restore net neutrality passed in Congress. Lawmakers are back in their districts for the August congressional recess, so we really need them to feel the pressure from the constituents and the small business community while they are back at home. If you can, click here and call your elected representatives to know that you want them to sign the net neutrality CRA discharge petition to restore strong protections ASAP.